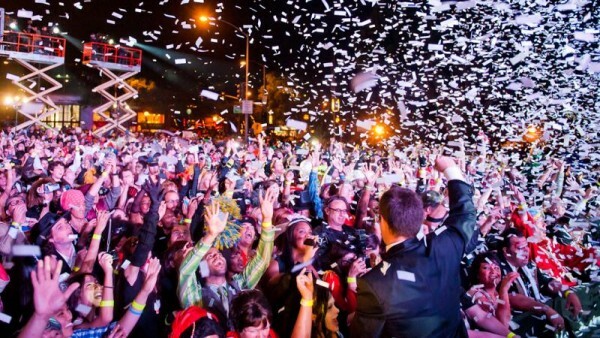 It’s easy to have fun at West Hollywood’s Halloween Carnaval. But how to negotiate it? That’s where things get complicated. The annual event is expected to attract hundreds of thousands of people on Wednesday night along Santa Monica Boulevard between Doheny Drive and La Cienega Boulevard. Its official hours are from 6 to 11 p.m. although the bars will be serving drinks until 2 a.m. The Halloween Carnaval will feature several areas on Santa Monica Boulevard with live DJs. Mayor John Duran and members of the West Hollywood City Council will host a brief program at approximately 9 p.m. at the San Vicente Stage located at the intersection of Santa Monica and San Vicente boulevards. –La Cienega Boulevard between Holloway Drive and Melrose Avenue will be closed from 4 p.m. on Wednesday, Oct. 31 to 6 a.m. on Thursday, Nov. 1. Additional street closure information is available on the city’s website at www.weho.org/halloween. Due to street closures, there will be modifications to Cityline Local and Cityline Commuter routes on Halloween day — details can be found online at www.weho.org/cityline. The city will suspend permit parking restrictions for the Halloween Carnaval from 11 a.m. on Wednesday, Oct. 31 to 12 p.m. on Thursday, Nov. 1. Parking meters fees will be waived citywide from 6 p.m. on Wednesday, Oct. 31 to 2 a.m. on Thursday, Nov. 1. Carnaval-goers are reminded to observe the boundaries of West Hollywood. If parking occurs in the City of Los Angeles or in the City of Beverly Hills, all parking restrictions must be strictly observed. Public parking will be available at lots throughout the city for a fee; lot location and price information is posted on the city’s website at www.weho.org/halloween. The city encourages Carnaval-goers to leave cars at home, to carpool, or to use public transportation options. Metro offers several transit options to get to West Hollywood. A trip planner is available at www.metro.net. –The PickUp (special service) — The PickUp will run from 8 to 11 p.m. along Santa Monica Boulevard and will stop at all regular eastbound stops between Sweetzer Avenue/La Brea Avenue. Once the PickUp reaches its La Brea Avenue stop, it will take an express route west toward the Halloween Carnaval via Melrose Avenue to its special Halloween stop on Kings Road/Santa Monica Boulevard. From 11 p.m. to 3 a.m., The PickUp will only run eastbound from Kings Road/Santa Monica Boulevard to La Brea Avenue/Santa Monica Boulevard. Additional information will be posted on the website for The PickUp at www.wehopickup.com and for Cityline at www.weho.org/cityline. –No weapons, fireworks or drones will be allowed. –Kids and pets are strongly discouraged because of the size of the crowd. The two dog parks at West Hollywood Park will be closed at 12 a.m. on Wednesday, Oct. 31 and will re-open at 6 a.m. on Thursday, Nov. 1 .